At distances large compared to the size of the source, sound intensity diminishes according to the inverse square law. This is relatively simple to reliably calculate, provided the source is small and outdoors where no echoes occur. In a reverberant sound field the calculation is more complex. If the noise source is outdoors and its dimensions are small compared with the distance to the monitoring position (ideally a point source), then as the sound energy is radiated it will spread over an area which is proportional to the square of the distance. This is an ‘inverse square law’ where the sound level will decline by 6dB for each doubling of distance. Note: distances can be in any units as long as units are consistent. Line noise sources such as a long line of moving traffic will radiate noise in cylindrical pattern, so that the area covered by the sound energy spread is directly proportional to the distance and the sound will decline by 3dB per doubling of distance. This is good to know if you live near a busy motorway. Close to a source (the near field) the change in SPL will not follow the above laws because the spread of energy is less, and smaller changes of sound level with distance should be expected. If the observation position very close to the source, at a distance that is small compared to the size of the source, the sound level changes very little with location in that source area. 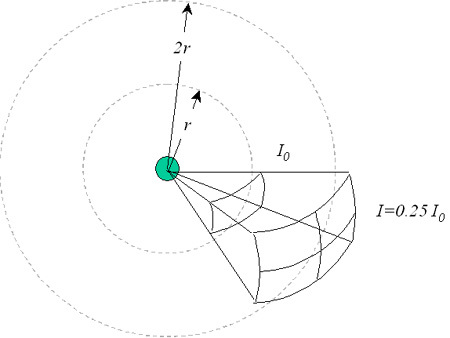 One may be able to determine the “virtual centre” of the whole sound field, whence inverse square law calculations can proceed in reference to that distance, for locations outside the source area. The surrounding environment, especially close to the ground, and in the presence of wind & vertical temperature gradients, has a great effect on the sound received at a distant location. Ground reflection affects sound levels more than a few feet away (distances greater than the height of the sound source or the receiver above the ground). 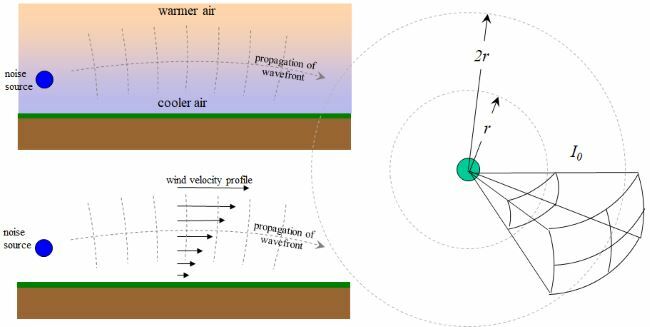 Wind and air temperature gradients affect all sound propagation beyond 100 meters over the surface of the earth. Close to the ground there is a wind speed gradient that results in the acoustic wavefront being diffracted towards the ground plane. When propagating the sound wave will be diffracted away from the ground plane. Hence it will be observed that sound propagates poorly when travelling into the wind and the observer is close to the ground plane. When the ground surface is cooler than the air just above it (temperature inversion), typically late at night and just before dawn, sound will travel great distances across the landscape even without any wind. In addition it is always necessary to take into account attenuation due to the absorption of sound by the air, which may be substantial at higher frequencies. For ultrasound, air absorption may well be the dominant factor in the reduction. The attenuation of sound in air at 20°C due to viscous, thermal and rotational loss mechanisms is 1.6×10-10f2dB/m. However, losses due to vibrational relaxation of oxygen molecules are generally much greater than those due to classical processes, and the attenuation of sound varies significantly with temperature, water-vapour content and frequency. We have a number of articles on Noise and Vibration, covering different topics and trying to relate them back to engineering and in particular model engineering.